Leader of the Opposition in the Lok Sabha Sushma Swaraj met Sri Lankan President Mahinda Rajapaksa in an unscheduled breakfast meeting on Friday. This comes soon after the one-on-one meeting she had with the Sri Lankan Opposition Leader, Ranil Wickramasinghe. Ms. Swaraj has had meetings with all Sri Lankan Tamil leaders, and has informally met many Ministers and politicians in the past four days. The invitation was extended to Ms. Swaraj, as Mr. Rajapaksa, who has been closely following the tour of the Indian joint parliamentary delegation, wanted to discuss the issues raised, in an informal atmosphere. Ms Swaraj has been clear that the delegation, being representatives of Parliament, stood for a united Sri Lanka. At a meeting in Jaffna on April 18, after one member went off on a tangent on the Tamil question, Ms. Swaraj said the Indian Parliament was against terrorism, and for a united Sri Lanka. Tamil National Alliance leader R. Sampanthan had repeatedly stated that he wanted a solution within the framework of a united Sri Lanka, she pointed out. The next day, handing over a railway project at Aluthgama, she said a genuine political solution was necessary. She also reiterated India’s commitment to remain closely engaged with the Sri Lankan government to advance the process of rehabilitation, reconstruction and national development. She said both the ruling party and the Opposition in India were on the same side on the issue of political settlement for the Tamils of the Northern Province. 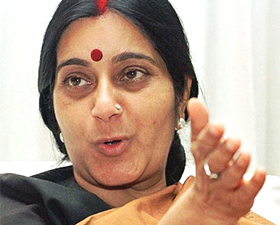 The Indian side has said Ms. Swaraj will share her impressions of the visit on Saturday before leaving for New Delhi. Indian High Commissioner Ashok K. Kantha, Sri Lankan Foreign Minister G.L. Peiris and President’s Secretary Lalith Weeratunga were present at the meeting. A meeting with the whole delegation, slated for later in the evening, was called owing to bad weather. The helicopters ferrying them had to land at Kurunagala, just over 90 km away. This meeting has been rescheduled for Saturday morning. On Friday, Ms. Swaraj visited Hatton to meet Tamils of Indian origin and to Batticaloa to meet Tamils in the eastern region. In Batticaloa, she inaugurated a vocational training school, and visited SWEA, an NGO that works with young widows. There are 45,000 widows in the Eastern Province in the districts of Trincomalee, Batticaloa and Ampara. About 13,000 are under the age of 23. Another muppet of an actress in the hands of the American Zionists who are running(runing) the whole world today. 7. Our discussions over the last four days have brought out clearly the need for expeditious implementation of the measures proposed by the LLRC with regard to information on missing persons and detainees, investigation of cases of disappearances and abductions, promotion of a trilingual policy, reduction of high security zones, return of private lands by the military and demilitarization, including phasing out of the involvement of the security forces in civilian activities and restoration of civilian administration in the Northern Province. We have noted the assurance given by the Government of Sri Lanka in Parliament that it will ensure the withdrawal of security forces from community life and confine their role to security matters.